Line the crock pot with foil or one of those handy-dandy crock-pot liners (that I always forget to pick up, so I end up just lining with foil. Just be sure to do either, because it makes clean up so much easier). Layer the bottom of the lined crock-pot with brown sugar. Press whole cloves into the ham so they are evenly distributed. You may score the ham for easier insertion if you wish, or go the ‘easy’ route and get a spiral cut ham like I do and push the whole cloves randomly into the sliced sections. Place the ham in a slow cooker cut (flat) side down. Pack the brown sugar on top of the ham, pressing into the cloves. Pour the maple syrup over the ham – some of the brown sugar will get washed away, but what stays on is a bonus. Sometimes I’ll sprinkle more brown sugar on after I pour on the maple syrup. Season the apple cider with cinnamon, nutmeg, ginger, ground cloves and vanilla. Pour into the crock pot until you get to the fill line. Preference is that you only want about 2 inches of ham above the surface, but if your ham exceeds the top of the crock pot like mine usually does, it doesn’t always work out that way. Add the orange peel to the pot. Cover and set to Low. Depending on the size of the ham, and whether or not it’s fully cooked or uncooked, you’ll want to cook it anywhere from 4 to 10 hours. Usually I get a spiral cut pre-cooked ham and it’s usually ready in about 3-1/2 to 4 hours on low. If your ham is too big to fit in your crock pot, you can cut it to fit, or when you line the crock pot with foil, make sure there’s enough extra to basically wrap over the top of the ham. When the ham is that big for my biggest crock pot, I’ll cover the top with foil, then set the crock pot lid on top just to make sure the heat is contained. I also check the ham frequently, and if there’s any part that sticking up out of the liquid, you want to either baste it frequently to make sure that part doesn’t dry out, or if you’re all about ‘easy’ (like me), just turn the ham over every so often to make sure every surface has a chance to be covered. 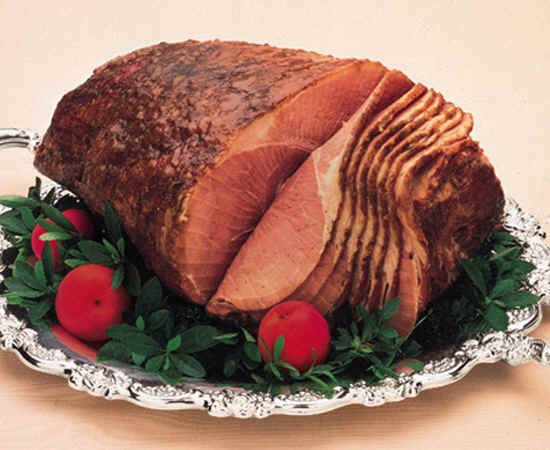 I’ll usually turn the ham after about 2 hours, then flip it back about a ½ hour before it’s time to eat. I recently did a rotisserie chicken in the slow cooker. Going to try this next! If I don’t have a crock pot and I cook the ham in an ordinary stainless steel pot in very slow fire, how long do you think do I have to cook it? Such a wonderful recipe you have shared and I think that these would be great for the coming Christmas. Thanks for sharing. This is the dish that I enjoyed, I usually use the pressure cooker. Meanwhile, to cook more quickly, before cooking, I usually order ham in the fridge between 2-4 hours. I have a question for you. can I use a pressure cooker to make ham? My son loves Ham (pretty much the only meat he likes) so we make it quite a bit. I tried this recipe yesterday in my slow cooker and it turned out beautifully…plus now my house smells like the Holidays…in June. Made great leftover ham sandwiches too.